* USB 3.0 interface. Plug and Play. * Compatible with Windows 2000/xp/Vista/7/8/mac os 7.0 and above. * Not compatible with SATA MINI PCI-E SSD/PATA MINI PCI-E SSD and RAID MINI PCI-E SSD. * Please note that the query rated current of SSD,compute maximum power supply current is 1A of USB 3.0 interface,if the USB port can't provide enough current to the ssd,the computer can't identify or work can't well because the power supply can't meet requirements;if such issues are within your computer USB 3.0 interface,please try to access USB 2.0 interface test it,because it can reduce the speed to reduce power consumption. * The SSD work will release heat,the shell fells, very hot,this is normal. * Please try not to use USB extension cable, because it will lead to can't meet the demand of the normal working current of the SSD. * Please cancel the hard disk password if your hard drive set a password in the original computer, The other computer doesn't recognize the hard disk if the password not cancel. * Please enter the disk manager to hard disk partition and format the hard disk If you open "my computer" can't see the increase of disk partitions. A: Unable to identify the SSD, but adapter card not to install SSD connected computers,the computer can identify new hardware. B: Adapter card to connect the computer after constantly connected and disconnected. C: Products to connect the computer, can read data of hard disk drive, but can't write data to the hard disk or format the hard disk partition, as long as write data will disconnect or a computer without any response (Hard disk has bad sectors will have this phenomenon, please pay attention to distinguish). There are six types of interface definition,they look exactly the same,so please be sure to distinguish your solid state drive's interface definition. Connects mSATA SSD safely to computer via USB port. 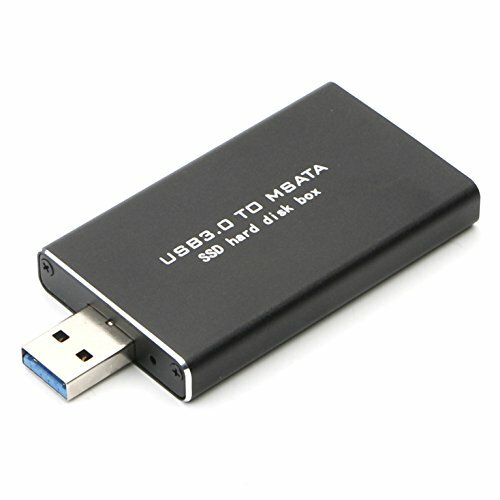 * Supports 30mm x 50mm mSATA SSD to USB 3.0 interface. Supports Plug & Play and Hot-Swapping (SSD is not include). Note: If your SSD is fist time use, should be install to the Converter, then setting Management device to reformatting the SSD, only in this way can SSD be recognized by computers. If you have any questions about this product by PXYELEC, contact us by completing and submitting the form below. If you are looking for a specif part number, please include it with your message.